The Phonexa team took Halloween celebrations to new heights this year with an epic costumed luncheon that some have called “the most ambitious crossover event in history.” Heroes from both the DC and Marvel universes—plus some traditional trick-or-treat characters—were out in force for Phonexa’s superhero-themed Halloween lunch party. Thor and Clark Kent could be seen chatting it up while Tony Stark broke bread with Batgirl and Wonder Woman. Various Ninja Turtles could be spotted hovering around (no doubt looking for slices of pizza). In all, the hard-working team was treated to a fun and festive mid-week Halloween party that allowed everyone to kick back and socialize for a while. As the food kept coming (three courses! ), it was a reminder of the kind of warm and welcoming company culture Phonexa typifies—building strong employee bonds over costumes and kebobs. 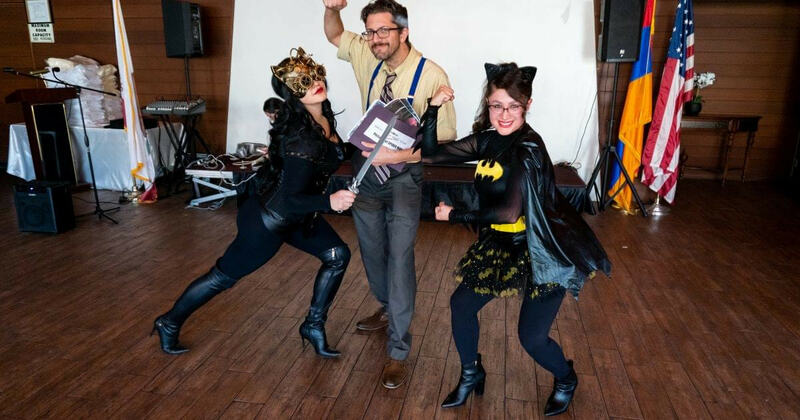 An employee costume contest added to the fun, with Tiara Gazarian’s “Steampunk Catwoman” winning the day, followed by Velia Murillo’s “Batgirl,” and Mark Kosin’s “J. Jonah Jameson from Spiderman’s Daily Bugle” rounding out the top three. If the day wasn’t thrilling enough, we were also happy to be featured on MyCorporation’s Halloween news blog, where we shared our caped-crusading Halloween plans.